Surprisingly affordable and much cheaper than messy cement or custom made metal plates. The Raven threshold ramp simply lays in place or permanently fixed with builders adhesive. 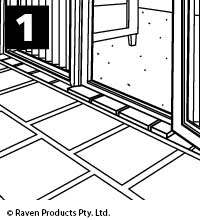 Raven threshold ramps meet acecss and mobility gradient 1:8 at door ways. 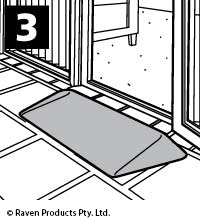 The Threshold Access Ramp is suitable for all types of situations. Clean area of dirt and dust before installation. 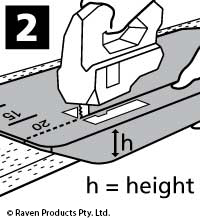 If required, trim the threshold ramp with a jig-saw using a coarse wood cutting blade. Cut along the height indicators provided. Simply lay ramp in place or fix permanently with builders adhesive.